As much as you might try, you can’t always prevent illness or injury. Dr. Spohn at Cedar Plains Family Medicine offer urgent care appointments for non-life threatening health needs, including allergies, minor injuries, and the flu. If you’re sick and need medical care and live in or near Hickman, Nebraska, call the office, or book an appointment online now. Urgent care refers to a type of health service that can manage non-life threatening urgent medical conditions. If you have a fever or a big gash on your hand, you know you need to see a health care professional, but may dread the thought of walking into an emergency room. Dr. Spohn and Sherry at Cedar Plains Family Medicine can get you the care you need to help you feel better without having to sit in the waiting room at the hospital. If you have a life-threatening condition, such as a chest pain, head injury, or difficulty breathing, call 911, or go to the nearest emergency room. What types of health issues are considered urgent care? 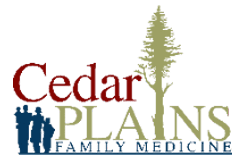 Dr. Spohn at Cedar Plains Family Medicine have a combined 50 years of health care experience, working in a variety of settings, and can handle almost an urgent medical condition. In fact, to help keep her skills sharp, Dr. Spohn also spends time as a hospitalist in the emergency department of a rural hospital when she isn’t taking care of you at her practice. As family medicine practitioners, Dr. Spohn take care of patients of all ages, whether it’s your child or your grandmother, if you need urgent care, Cedar Plains Family Medicine can help. What can I expect during an urgent care visit? Because you have an urgent medical condition, you won’t wait long before you’re seen by either Dr. Spohn. During your examination, they’ll want to know about your illness and injury to best direct care. Although you may be at the office for an urgent health care need, your health care professionals at Cedar Plains Family Medicine conduct a thorough physical examination to assess your overall health, not just your illness or injury. After Dr. Spohn have completed their assessment, they formulate a diagnosis and treatment plan, which may include medication, referral to a specialist, or additional testing. For an urgent medical matter, call Cedar Plains Family Medicine, or schedule an appointment online.